There will apparently be lots of opportunities to rest your wrists in Skyward Sword. Legend of Zelda: Skyward Sword might be upwards of fifty hours long, but for nearly two of those hours, you're not going to be doing anything except watching what's going on onscreen. According to the official Zelda Facebook page, the game has 100 minutes of cinematic cutscenes. The news comes by way of Nintendo's pre-Tokyo Game Show press conference, the same place we received the news that the game could take anything up to a hundred hours to complete. 100 minutes might seem like a lot, but spread out over such a long game, it probably won't be particularly arduous to sit through them all, especially if Nintendo is using the word "cinematic" in a loose sense, and is including things like the little scenes that play when you open a chest or pick up a piece of heart. 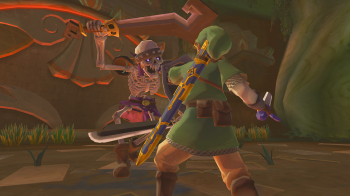 Considering that Nintendo is trying a lot of new things with Skyward Sword - new items, new setting and a new villain, just to name a few - I'm quite happy to be spending so much time with the game, both playing it and watching it. Legend of Zelda: Skyward Sword comes out for the Wii on November 20th.